Vegetarianism is on the rise and the people who convert claim personal health and well-being as a major factor for adopting a plant-based diet. At the same time, research claims the health benefits of a vegetarian diet in lowering heart disease, obesity, diabetes, arthritis, and cancer. Brussels sprouts belong to the cabbage family, and look like tiny cabbages. The tiny sprouts are loaded with healthy benefits and provide some cholesterol-lowering benefits. When steamed, the Brussels sprouts bind together with bile acids in the digestive tract. The bile acids are easily excreted lowering the cholesterol levels. Brussels sprouts have the maximum content of glucosinolate, which is an important phytonutrient. Not many people are fans of Brussels sprouts, and this nutrient powerhouse gets a bad rap. Most people are skeptics of the sprouts, and I don’t know too many people who love them. I was one of those skeptics too, until I created this dish. I had read so much about the health benefits of Brussels sprouts that I wanted to make it interesting and yummy. The dish was an instant hit with family and friends. The recipe is quick and simple, using very few ingredients. Trim and halve the Brussels sprouts. Blanch the sprouts in boiling water for a few minutes, drain and set aside. Cook the lima beans and set aside. Heat the extra virgin olive oil in a skillet and add the minced garlic. After a few seconds add the chopped leek and stir. Add the red pepper flakes to the skillet, and salt to taste. 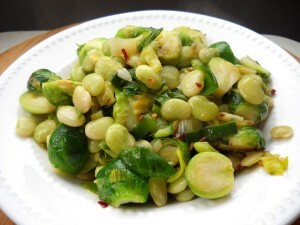 When the leek softens (do not brown), add the Brussels sprouts and lima beans. Toss well. Sprinkle fresh lemon juice and serve. This entry was posted in Arthritis, Cancer, Diabetes, Diet, Food, Health and Wellness, Healthy Recipes, Heart Disease and tagged Arthritis, Brussels Sprouts, Cancer, Diabetes, Heart Disease, Lima Beans, Obesity, Vegetarian Diet, Vegetarians. Bookmark the permalink.